Is There A Time Limit For Submitting Reservations or Bills? Do I need to inform the hotel that I am a member of The Guestbook? Will I be able to redeem rewards if I live outside of the United States? How do I calculate the amount of loyalty rewards that I receive? How long will it take for me to receive my loyalty rewards? Trip Cash is a special redemption option that encourages members to explore The Guestbook’s portfolio of hotels. In most cases, a Trip Cash redemption is worth three times the amount of a non-Trip Cash redemption. Trip Cash must be redeemed on a future stay in another destination (>30 miles/50 km) from where it was originally earned and must cover at least the value of one night’s stay. Trip Cash is not subject to blackout dates or capacity restrictions. Yes. Trip Cash earned each calendar year must be redeemed towards a Trip Cash Booking by March 31st of the following year. Trip Cash redeemed towards a booking that is later cancelled will be returned to the member account as long as the Trip Cash value has not expired. As a reminder, any rewards redeemable for PayPal or other gift card options will never expire, even if the Trip Cash premium associated with it does. CAN I EARN NEW REWARDS ON A TRIP CASH STAY? Yes. Members may earn new rewards on all Eligible Charges not covered by Trip Cash. For example, if a member redeems $100 of Trip Cash on a 3-night stay (3 x $100 = $300 pre-tax), new rewards will be earned on the remaining $200. These new rewards will be tracked in the member’s account. WHEN DID TRIP CASH CHANGE FROM 10% TO 15%? To make staying at our hotels even more rewarding, The Guestbook increased its Trip Cash value from 10% to 15% in 2019. All stays with checkout dates in 2018 earned Trip Cash at the 10% level. All stays with checkout dates beginning 1/1/2019 will earn 15% Trip Cash, even if the stay was originally booked in 2018 or earlier. How Is Trip Cash Redeemed? Trip Cash may be redeemed by visiting the Redeem page once a member has rewards available. 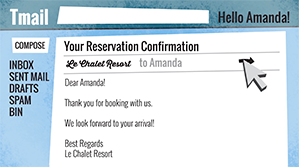 The Trip Cash reservation must then be booked directly on The Guestbook site to handle the specialized reward redemption procedure. Once Trip Cash is selected, the member may search for hotel availability based on the Trip Cash rules. The member then pays the full value of the hotel stay as if it were a normal booking, and the Trip Cash value is sent to the member after the stay is completed via the method selected in the booking process, such as PayPal. Note: Trip Cash is associated with its underlying cash back redemption value, if any. Any redemption of one reduces the other on a proportional basis. WHAT IF I TRY TO REDEEM TRIP CASH IN THE SAME DESTINATION WHERE IT WAS EARNED? The Trip Cash redemption search will automatically calculate the Trip Cash available for redemption for any given hotel by calculating the distance from where the Trip Cash was earned. If a member has earned rewards in multiple destinations, then only those rewards earned in destinations that meet the distance criteria will be eligible for redemption, and the Trip Cash value that does not qualify will remain for a future Trip Cash redemption.